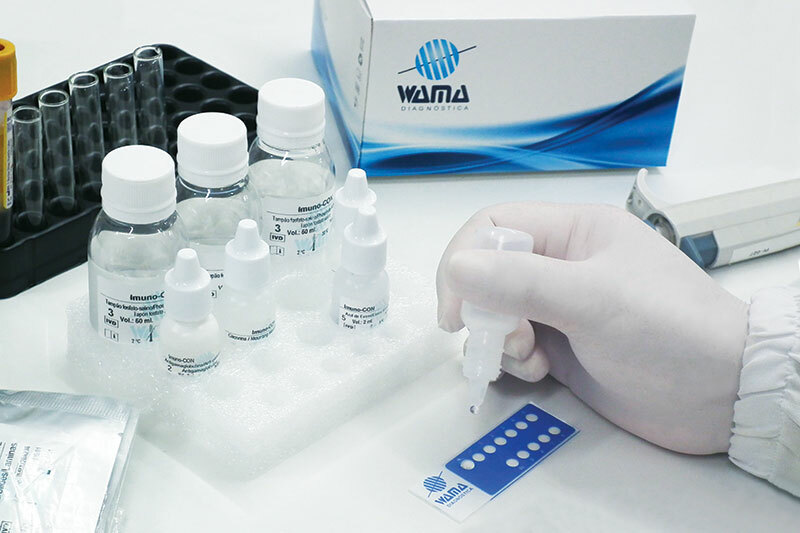 Imuno-Con line is exactly what the clinical laboratories need for Imunofluorescence tests, that is, all reagents are standardized and ready-for-use, decreasing the time consuming at slides preparation and titrations. Therefore, this line offers the highest quality results. An indirect immunofluorescence kit for the qualitative and semiquantitative detection of antinuclear antibody (ANA) in human serum. An indirect immunofluorescence kit for the qualitative and semiqualitative detection of anti-neutrophil cytoplasmic antibodies (ANCA) in human serum. An indirect immunofluorescence kit for the qualitative and semi-quantitative detection of anti-DNA antibodies in human serum. An indirect immunofluorescence kit for the detection of antiTrypanosoma cruzi antibody in human serum. An indirect immunofluorescence kit for the detection of antiTreponema pallidum antibody in human serum. An indirect immunofluorescence kit for the qualitative and semi-quantitative detection of antibodies anti-Toxoplasma gondii in human serum.